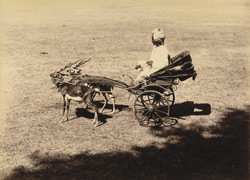 Photograph of a carriage pulled by deer at Baroda, Gujarat from the Curzon Collection, taken by an unknown photographer during the 1890s. The small two-wheeled carriage belonged to Gaekwar Sayaji Rao III (ruled 1875-1939), 12th Maharaja of Baroda. He owned a collection of exotic transport, which also included solid gold and silver carriages drawn by caparisoned bullocks. They were displayed to visitors and used on ceremonial occasions.